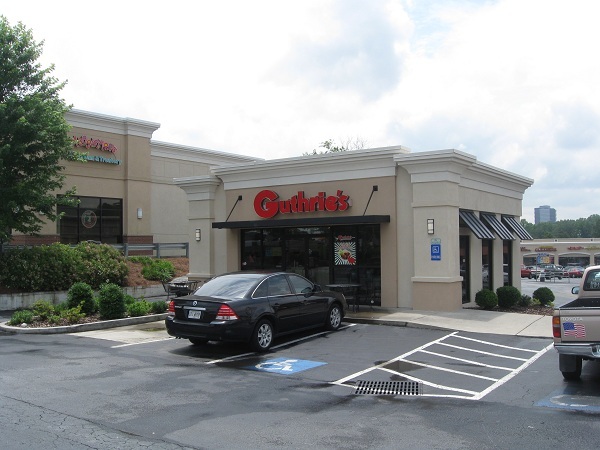 Guthrie’s, Dunwoody GA (CLOSED) – Marie, Let's Eat! Guthrie’s couldn’t have had much less stuff at all. The menu consists of really incredibly amazing chicken fingers, Texas toast, fries and slaw, served in a handful of ways. 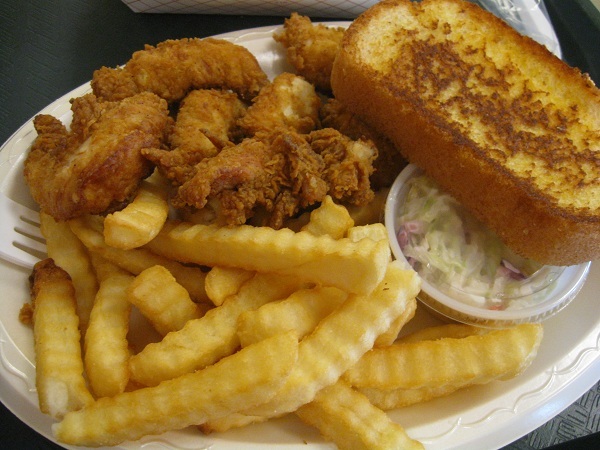 I recall that if you stopped at the Guthrie’s on Baxter Hill, you could get them in a plate, in a box, in a smaller size without slaw or between two slices of bread. Those were your only options. They were absolutely essential to the dorm dining experience. Everybody who lived in the high-rise dorms had Guthrie’s all the time and those of us by the stadium regularly; so did thousands of tailgaters and high school students. The line out the door whenever Clarke Central was playing at home in the fall was every bit as insane on a Friday as on a UGA game day. That Guthrie’s was the third in the chain, which is quite successful today in its home state of Alabama, with scattered outposts in other Southern states. In the early nineties, Guthrie’s opened a second Athens store, over by Cedar Shoals High School, so their students could enjoy the same Friday night craziness. This was a hugely important Athens tradition in the 1980s and 1990s, and its simplicity fueled wonderful urban legends. Some said there was a secret menu, and some said that if you left a penny in the sauce – a sort of peppery brown mayo, totally delicious – overnight, you could retrieve it polished and glittering. Then one day in the late ’90s, the Athens locations were gone. It was very abrupt and their departure fueled a whole new raft of urban legends, which I’ll decline to repeat in these pages. Some stories are best left unreported, if unconfirmed. Talk radio should try that sometime. Several years later, Guthrie’s returned ever-so-briefly to the Athens region, opening a store twenty-ish miles north in Danielsville. It’s gone now, but there are two stores in the Atlanta area along with the twenty-ish restaurants in Alabama and six in other states. I was working in the Ravinia building when the Dunwoody store opened in 2004 and a co-worker mentioned it. She thought, wrongly, that it was a Zaxby’s knockoff. I let her know it was the other way around, but you can bet that Guthrie’s glacier-like speed at expanding is going to run into that everywhere. If they try moving into Louisiana, they’ll be called a Raising Cane’s clone. Guthrie’s is an occasional destination for us, whenever we need a quick meal on the top end of I-285 while going out of town through Spaghetti Junction. On Friday, Marie and I had hoped to get lunch further up the road as we started an anniversary getaway, but trouble leaving work early meant that we didn’t get on the perimeter until after the lunch rush had already ended, and the Spaghetti Junction backup already showing signs of starting. (You’ll notice I don’t say who had trouble leaving early. Maybe I’m polite, or maybe I just don’t want you to think ill of me.) This store has expanded their menu just a little, adding wings and breakfast to their offerings, but what they need to do is hire somebody to straighten that place up some. Nobody ever stopped at Guthrie’s wanting cleanliness – that Baxter Hill store looked like a war zone from sunup to sundown – but I’m starting to get at the age where I want somebody to get out from behind the counter and wipe down dirty tables. Then again, it’s not like this is haute cuisine; it’s finger-gooping greasy fried chicken fingers, done right. You remember how one day you went through a Zaxby’s drive-thru and didn’t have to wait for your food and the sauce came prepackaged in a factory-made plastic cube with the ingredients on the label? Guthrie’s reminds you of the days before Zaxby’s got corporate enough to change into that. Or, if you will, the days before there was a Zaxby’s. I hope that they’re always around, somewhere, and that there will always be people who will spread the word that theirs was the better restaurant, first. Now if only I could convince Guthrie’s to serve up those fried mushrooms and Fanta Cherry that their imitator has. Don’t you judge me. Posted on June 6, 2010 July 29, 2017 by Grant G.Posted in atlanta, chicken, georgia, goodbye, regional chainsTagged atlanta, chicken, closed!, dunwoody, georgia, regional chains. This location closed in August 2013, and a recent incident proves my position about never eating anything that you enjoy when you’re angry. …to find a note on the door saying that they’d moved to Tucker. It’s very difficult to break the land speed record on I-285 at 2.40 pm, but I came close. Grumbling that the least the office could have done was send a dang postcard, I found the new office, and we rushed to the door, to find it locked. Confused and aggravated, I found the doctor’s number and phoned. They had indeed closed their Dunwoody office, but the Tucker office was not open on Wednesday or whenever it was. On that day, they were open in Riverdale. I’d rather not eat in my wonderful car. I sat on the step and chowed through my Guthrie’s after asking whether they wouldn’t mind phoning in a refill what with me sitting on the other side of town from them. I’m a reasonable man; I understand mistakes happen, and I didn’t complain to the receptionist. We just got a new doctor. In Smyrna. That lunch from Guthrie’s? It didn’t taste good. It didn’t taste like anything. It was fuel, not food, and good places deserve better than to have their food eaten in that mood. In Georgia, there’s apparently still a location in Norcross at the moment, and one in Ringgold that’s not too far from I-75. There is one in Ringgold, exit 348 on I-75,(fairly new as it was opened after the tornado wiped out the area 3 years ago) and one in Trenton GA (exit 11 on US-59). I frequent both and they are always clean (spotless even) and the food is always good. I hate the hear that some other locations were not too great. Thank you for writing, Ann! That’s right, I did read that there is one in Trenton. We’re never on that stretch of interstate, but we might stop by the one in Ringgold one day. I wonder whether Guthrie’s has ever tried to get a foothold in Chattanooga? Pingback: Nostalgia Burns in the Hearts of the Bulldogs – Marie, Let's Eat! Pingback: Takorea, Dunwoody GA – Marie, Let's Eat! Pingback: Guthrie’s, Norcross GA – Marie, Let's Eat!